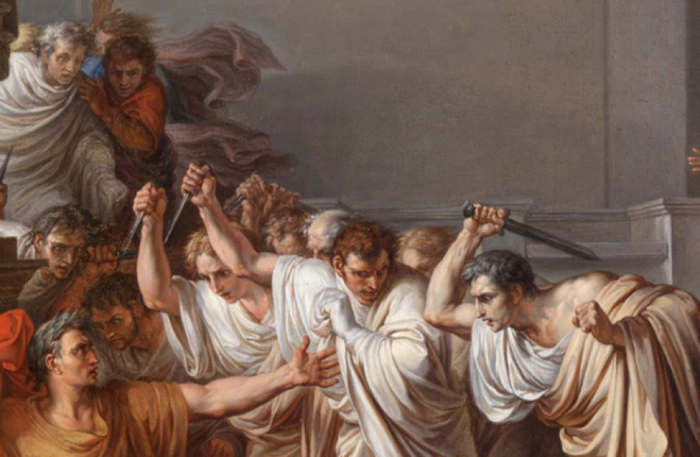 Image: The Assassination of Julius Caesar by Vincenzo Camuccini, public domain. Beer, doughnuts, and genetics textbooks have one thing in common: they were all made possible by collaborations between humans and yeast. Our fungal ally Saccharomyces cerevisiae resides not only in breweries, bakeries, and laboratories, but also sometimes in our own bodies—where, on rare occasions, it betrays us. S. cerevisiae is increasingly being reported as an opportunistic human pathogen, sometimes even in non-immunocompromised people. Infections remain rare overall, but studying them presents an exceptional opportunity to understand how benign fungi can turn destructive. Such lethal transformations are more common in some other fungi, but those species are often difficult to grow and manipulate in the lab. In contrast, the long history of S. cerevisiae use in laboratory research means there are many powerful tools for working with the species. If baker’s yeast and other fungi become pathogenic through similar mechanisms, understanding S. cerevisiae infections could have broad implications. With this in mind, Phadke et al. searched for traits that allow S. cerevisiae to invade a model host: the larval form of the greater wax moth Galleria mellonella. This moth is often used in studies of innate immunity, and because it doesn’t naturally cohabitate with S. cerevisiae, the yeast shouldn’t have any preexisting adaptations that would allow it to infect the moth. This means investigating how yeast infect it can inform researchers about fungal pathogenesis in general. Comparing yeast strains derived from clinical samples to ones from environmental samples revealed that strains from both groups were equally likely to be pathogenic in the moths. Although this conflicts with findings in mice that clinically isolated strains are more likely to be pathogenic, the studies do concur that pathogenic strains are more likely to be able to form pseudohyphae—elongated strands of cells that remain joined after cell division. The researchers used a library of yeast deletion mutants to screen for strains that grow better or worse in the moth larvae than in standard conditions. They noticed that one strain that struggled to infect the moths lacked the gene slt2, which encodes a protein that helps maintain part of the yeast’s cell wall. This part of the cell wall normally shields fungal molecules that the host could recognize. If these molecules were noticed by the moth immune system, it could cause a defensive response against the yeast, providing a possible explanation for the strain’s inability to infect the moths. This finding aligns with previous observations that cell wall integrity genes are important for other opportunistic fungal pathogens to infect hosts. Several genes encoding mitochondrial proteins were also more important for yeast growing in the moth larvae than they were for cells growing in vitro, but since mitochondria have so many roles in the cell, it’s difficult to say how exactly these genes affect pathogenesis. The screen also turned up genes involved in metabolism of some aromatic compounds. In most cases, strains with one of these genes deleted grew better in the moths than they did in vitro, indicating that the genes aren’t important for pathogenesis—but two strains suffered dramatic fitness hits. Both strains were mutant for genes required for the synthesis of two aromatic amino acids, tyrosine and phenylalanine. In mice, S. cerevisiae infection is greatly attenuated if the yeast cannot synthesize aromatic amino acids, and infection in the moths may be similar in this regard. This work asserts that some of the genetic underpinnings of pathogenesis are shared among S. cerevisiae and other fungal opportunistic pathogens and fuels hope for development of a broad-spectrum treatment targeting numerous fungal infections. It also demonstrates the power of our alliances with laboratory models—even when they go on the attack. Phadke, S.; Maclean, C.; Zhao, S.; Mueller, E.; Michelotti, L.; Norman, K.; Kumar, A.; James, T. Genome-Wide Screen for Saccharomyces cerevisiae Genes Contributing to Opportunistic Pathogenicity in an Invertebrate Model Host.